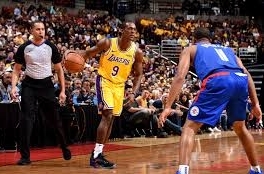 LOS ANGELES -- The Los Angeles Lakers and the Los Angeles Clippers traveled to nearby Anaheim for a preseason game that was away from their shared home floor -- the Staples Center. A sold-out crowd of 18,040 fans made their way to the Honda Center and were entertained by a close game that ended at 51-50 at the half before the Clippers blew it wide open in the fourth quarter to win, 103-87. Lou Williams and Tobias Harris handled much of the scoring load for the Clips with 19 and 18 points, respectively. Montrezl Harris and Shai Gilgeous-Alexander finished with 12 apiece. The Clippers made 37 of 90 field goals (41.1 percent), 6-of-21 threes (28.6 percent) and 23 of 29 free throws (79.3 percent). LeBron James did not suit up (rest) so Kyle Kuzma assumed the scoring cudgels with 14. Brandon Ingram and Kentavious Caldwell-Pope accounted for 10 apiece but no other Laker scored in double figures. The Lakers sustained their offense with 14 triples but they fared only 35-of-91 from the field, a poor 38.5 percent clip.